There is ample evidence that environmental factors are involved in the aetiology of type 1 diabetes, but the nature and timing of the interactions are poorly understood. The intrauterine environment is known to play a role in the later development of type 2 diabetes, and this review considers a possible role in type 1 diabetes. Autoimmune type 1 diabetes is rare in those diagnosed before 6 months of age, but endogenous autoantibodies predictive of future type 1 diabetes may be detectable by 6–12 months of age, suggesting that environmental factors may operate before this age in some cases. Indirect evidence of a protective effect for the intrauterine environment comes from the observation that mothers with type 1 diabetes are less likely than affected fathers to transmit diabetes to their offspring, although the precise role (if any) is unclear. The risk of childhood-onset type 1 diabetes increases with maternal age at delivery, and with high birthweight, but these associations are weak and heterogeneous, and these factors are unlikely to be directly causally related to type 1 diabetes. No firm conclusion can be drawn from studies of maternal enteroviral infection or from various nutritional exposures. The birth process itself may play a role, as suggested by the slightly increased risk in children born by Caesarean section; lack of contact with maternal bacteria is one suggested mechanism. In sum, there is circumstantial evidence, but no proof of principle, that maternal or intrauterine conditions may modulate genetic risk of type 1 diabetes. The disease process culminating in type 1 diabetes typically begins in early life, but it is not clear whether the trail begins before or after birth. ‘Perinatal’ factors such as birth order and maternal age at delivery have long been investigated in studies of the aetiology of various postnatal traits such as intelligence , but the idea that chronic diseases that typically present in adult life, such as cancer and diabetes, might originate in utero is only slowly gaining acceptance [2, 3]. Although the mechanisms remain poorly defined, an association between low birthweight and increased risk of type 2 diabetes is now fairly well established . Curiously, a high birthweight (>4 kg), appears to be associated with an increased risk of childhood-onset type 1 diabetes [4, 5], as discussed below. The intrauterine environment has also been proposed to influence the development of the immune system and risk of atopic disorders in children [6, 7, 8]. Although there is compelling evidence that genetic factors determine susceptibility to type 1 diabetes, many lines of evidence, including the rapidly rising incidence of the condition, indicate an important role for non-genetic factors [9, 10]. Nevertheless, no single environmental factor has as yet been convincingly implicated in the aetiology of the condition. One possible reason for this is that environmental influences may operate through a transient window of opportunity in early development, long before the disease or even early markers of the disease process become manifest. In theory at least, such influences could act (1) to initiate the disease before potentially harmful immune responses have been activated; (2) to promote (or delay) the progression of an established immune response leading to overt diabetes; or (3) to precipitate diabetes in those with incipient beta cell failure. Recent reviews have considered the potential roles of postnatal environmental exposures in the aetiology of type 1 diabetes, including dietary factors such as infant feeding [11, 12], postnatal growth [13, 14], viral infections [15, 16], gut microbiota  and toxins . Here, we review evidence concerning possible links between the prenatal environment and the later development of immune-mediated diabetes. In type 1 diabetes the pancreatic beta cells are selectively destroyed by the immune system, and autoreactive T cells are thought to be responsible . The details of these mechanisms are complex and beyond the scope of this review. A large number of genetic susceptibility loci have been identified, generally with very weak effects . The exception is the HLA genes, which play a major role in the aetiology of type 1 diabetes . In recent years, the proportion of children with new-onset type 1 diabetes who carry the highest risk (DR4-DQ8/DR3-DQ2) genotype has decreased in many populations [22, 23]. This suggests that unidentified changes in the environment have contributed to a higher penetration of ‘permissive’ genotypes. Islet autoantibodies directed against insulin, glutamic acid decarboxylase, islet antigen 2 (also referred to as IA-2 or protein tyrosine phosphatase, receptor type, N) or zinc transporter 8 generally appear in the circulation years before clinical onset, and can be detected in ∼90% of individuals at diagnosis [19, 24, 25]. Current evidence suggests that these are not directly involved in beta cell killing, although it has been controversially suggested that anti-idiotypic antibodies protect healthy humans from autoimmunity, and that a lack of these may permit islet autoantibodies to be become pathogenic . While continuing to mature throughout gestation and during the postnatal period, the beta cells  and an immune system capable of targeting them [28, 29] are functional in the fetus by around mid-gestation. Nevertheless, classical autoimmune type 1 diabetes is probably never expressed in neonates and is rarely responsible for diabetes presenting under the age of 6 months. In accordance with general immunological principles, it is therefore possible that the fetus somehow promotes a state of tolerance . Islet autoantibodies can sometimes be detected in umbilical cord blood, and conflicting data on the importance of these have been published [31, 32, 33]. While more high-quality studies in this field are welcome, the available data from humans suggest that islet autoantibodies in cord blood are usually transplacentally transferred from the mother and are not associated with an increased risk of type 1 diabetes in the child [33, 34]; indeed the largest study of maternal islet autoantibodies suggests they may in fact be associated with a lower risk in the offspring . In birth cohort studies, seroconversion for disease-predictive islet autoantibodies has occasionally been shown to occur before 6 months of age . Long-term follow-up has shown a peak incidence of seroconversion for islet autoantibodies at around 9–18 months of age, and most of those who progress to type 1 diabetes during childhood express islet autoantibodies before 2–4 years of age [24, 25]. Although current evidence suggests that seroconversion for clinically relevant islet autoantibodies is a postnatal phenomenon, it is nevertheless possible that events taking place before or shortly after birth have the potential to influence the later development of islet autoimmunity and type 1 diabetes. The mechanisms involved are unknown, but some general possibilities are listed in the text box [36, 37, 38], and some are discussed in more detail below. Because non-twin sibling pairs and dizygotic twin pairs both share 50% of their genes, a higher risk in individuals with an affected dizygotic twin compared with that in individuals with an affected non-twin sibling would indicate that the intrauterine environment or shared early life environment influences the risk of disease, assuming that twinning and birth order are not themselves associated with risk. Available risk estimates for recurrence in dizygotic twins [39, 40, 41, 42, 43] tend to be somewhat higher than most risk estimates for non-twin sibships [44, 45], and this difference was greatest in a recent study from Italy . However, such twin estimates are imprecise and vary between studies, and directly comparable estimates for non-twin sibships are not available. More large-scale studies in this field are therefore necessary before we can draw firm conclusions. Warram et al first made the curious observation that maternal disease was associated with lower risk of type 1 diabetes in the offspring than was paternal type 1 diabetes , later confirmed by many others [47, 48, 49]. The underlying mechanism is unknown, but a role of the intrauterine environment has been proposed, for example, stimulation of beta cell growth and maturation by maternal hyperglycaemia. HbA1c during pregnancy in women with type 1 diabetes does, however, suggest a U-shaped relationship with risk of islet autoimmunity or type 1 diabetes in the offspring in the German BABYDIAB study , which is not easy to explain in relation to this hypothesis. Most familial aggregation studies show that relatives of patients with early-onset disease are themselves at higher risk of early-onset disease, as might be expected because of a stronger genetic contribution [51, 52], but not all data regarding age of onset in mothers are consistent. Harjutsalo et al recently found no association between age at onset in affected mothers and risk of type 1 diabetes in offspring, and noted that the higher risk associated with paternal type 1 diabetes was only observed when parents contracted type 1 diabetes during childhood . Other studies have reported similar patterns, albeit not statistically significant ones [47, 54], whereas a clinic-based study from the USA reported a higher risk for offspring of mothers with very early onset but no association with paternal age at onset . Studies of the offspring of mothers who developed type 1 diabetes before or after pregnancy might help to dissect out the relative contribution of the intrauterine environment compared with inherited mechanisms, but the relative rarity of pregnancy in adult-onset diabetes and the need to control for differences in age at onset would make such a study difficult to perform . Systematic reviews and individual patient data analyses of perinatal factors and risk of type 1 diabetes in recent years have involved more than 20 studies and up to 10,000 cases of type 1 diabetes. Weak, heterogeneous but overall statistically significant associations with risk of diabetes in the offspring have been found for Caesarean section, birthweight and maternal age at delivery (Fig. 1) [5, 56, 57, 58, 59, 60, 61]. Many of the individual studies included in the pooled analyses did not demonstrate significant results by themselves, and in many cases the direction of the association was not consistent across studies. Most original studies used a case–control design, which is susceptible to selection bias and sometimes to recall bias, but most results tended to be consistent in the few, albeit large, cohort studies. A few longitudinal studies of genetically susceptible children have also investigated some of these factors in relation to the development of islet autoantibodies. This is an interesting strength of such longitudinal studies, but the number of children with islet autoimmunity in these has generally been much lower than that in studies with clinical type 1 diabetes as the endpoint [62, 63]. These perinatal factors are most likely proxies for other related but unidentified environmental exposures that may play different roles in different populations, and the main value of these studies lies in hypothesis generation. A number of other routinely recorded perinatal factors have also been studied in relation to type 1 diabetes, but most have shown no consistent association. Studies of varying design relating maternal age and birth order to type 1 diabetes were carried out between the 1960s and 1990s [64, 65, 66, 67]. The pooled analysis of newer studies showed heterogeneity in the strength of the association, but most suggested increased risk among the offspring of mothers who were older when they gave birth . No satisfactory explanation has been proposed, but we can speculate that maternal age may be a marker of some kind of accumulated maternal exposure. The association with paternal age, independent of maternal age and birth order, has not been systematically reviewed. A few studies have found such an independent positive association, while others have not. In rodents, parental diet has been shown to influence the degree of DNA methylation, levels of micro RNA and gene expression (mRNA) in the tissues of offspring [68, 69]. While the relevance in human type 1 diabetes is unknown, this provides a possible mechanism for paternal non-genetic influence on the offspring. The potential role of epigenetic mechanisms in type 1 diabetes is discussed in some more detail below. The ‘hygiene hypothesis’ is usually attributed to Strachan, who found that eczema and hay-fever were less common in children with older siblings in the household . The author suggested that this was explained by greater exposure to infections contracted by their siblings in the early neonatal period, but he did not consider other potential factors. Although an attractive hypothesis, for type 1 diabetes this has not been further supported by analyses of specific infection or more direct estimates of exposure to other children in individual-level epidemiological studies. In theory, prenatal mechanisms such as maternal immunity could be involved in the birth order association with type 1 diabetes, such as immunity to paternal tissue antigens or other forms of altered feto-maternal immune response with successive pregnancies. However, birth order associations with type 1 diabetes are weak and heterogeneous , suggesting that the effect may be minor, non-existent or confounded by other factors. The recent observation that children born to mothers after short (<3 years) inter-birth intervals have a lower risk of type 1 diabetes than children born after longer intervals should also be explored further . Caesarean section is associated with a relative risk for type 1 diabetes of approximately 1.2, with variation among studies . Recent results from the German BABYDIAB study suggest that Caesarean section is not associated with risk of islet autoantibodies, but is associated with risk of progression from islet autoimmunity to clinical type 1 diabetes . This should be replicated in other longitudinal studies. Regardless of whether the association is primarily with islet autoimmunity or with progression from islet autoimmunity to clinical type 1 diabetes, the underlying mechanism is unknown. A possible explanation involves an alteration in the timing and composition of the infant gut microbiota following Caesarean section , but this remains speculative . Pooled analysis suggested a weak, statistically significant but heterogeneous positive association between birthweight and type 1 diabetes, independent of maternal diabetes . Data from offspring of women with type 1 diabetes are probably not comparable to those in the general population, but such data from the German BABYDIAB study suggested an inverted U-shaped relationship between birthweight and risk of islet autoimmunity or type 1 diabetes . Confounding by genetic polymorphisms such as HLA and INS has been proposed, but the evidence does not seem to support a genetic explanation for the association between high birthweight and type 1 diabetes in the general population . Shorter gestational duration is also weakly but significantly associated with risk for type 1 diabetes [4, 56, 67]. The mechanisms have not been elucidated, but it has been speculated that high birthweight or rapid postnatal growth is associated with higher insulin secretion, which might, according to in vitro evidence, render the beta cells more susceptible to damage . Since both perinatal body size and growth seem to be associated with obesity later in life, as well as the timing of puberty, subtle modulation of insulin secretion and action might mediate the association between perinatal body size or growth and later risk of type 1 diabetes . Dahlquist and Källén noted an unexpected association between maternal smoking during pregnancy and reduced risk of type 1 diabetes . The topic has never been systematically reviewed, but we identified at least 11 additional studies presenting data on this association in a comprehensive search, albeit with large heterogeneity in resolution and quality of data. Results were once again heterogeneous, but studies in which the information on maternal smoking in pregnancy was registered before or soon after birth (rather than by retrospective recall) tended to be consistent with the initial observation by Dahlquist and Källén [76, 77, 78, 79]. We identified published data from four birth cohort studies with longitudinal follow-up for islet autoantibodies [62, 63, 80, 81]. While the total number of cases was only 244, and none of the studies showed significant associations, the point estimates for the relative risk appeared quite homogeneous at about 0.5 to 0.7. Maternal smoking might influence some aspects of immune function  and DNA methylation  in the offspring, but the suggestive association between maternal smoking in pregnancy and lower risk of type 1 diabetes in the offspring should be interpreted with caution because of the many possible sources of error, not to mention the public health hazards of smoking. Congenital rubella is due to infection of a non-immune mother during pregnancy and viraemia of the unprotected fetus. The syndrome is variable in its presentation owing to variation in the timing and severity of infection, but features include low birthweight, deafness and mental retardation. In a 25 year review of patients with congenital rubella who were born around 1940, one of 50 patients was found to have undiagnosed diabetes  and further cases were later reported . Rubella virus has also been recovered from the pancreas of infected children. It is often stated that approximately 10–20% of individuals affected by the congenital rubella syndrome have diabetes [85, 86], but a number of other studies indicate a much lower risk. Furthermore, the patients in the reports included adults with impaired glucose tolerance and diabetes not treated with insulin, or the clinical characteristics were poorly described (see [9, 87] for original references). Some patients may have had typical features of type 1 diabetes, but many were atypical, and possible alternative causes of hyperglycaemia included persistent viraemia, low birthweight and pancreatic dysgenesis. Congenital rubella is now prevented by routine immunisation in most parts of the world, and the real answer may never be known. We conclude that rubella virus provides proof of concept that intrauterine infection can predispose to diabetes later in life, but that the evidence linking it to (or providing a model of) type 1 diabetes is inconclusive. In some studies maternal enterovirus infections have also been reported to be associated with type 1 diabetes. Inconsistent findings have also been reported, mostly from small to moderate size studies using various methods . The largest study to date suggested a moderate association between serological evidence for maternal enterovirus during pregnancy and increased risk of type 1 diabetes in children . The potential roles of postnatal enterovirus and other virus infections have been extensively reviewed elsewhere , including plausible mechanisms involved, and this will not be covered here. Methodological difficulties complicate interpretation of the data on intrauterine enterovirus and other virus infections, and once again no certain conclusions can be drawn. Several aspects of early-life nutrition have been suggested to influence the risk of islet autoimmunity or type 1 diabetes, and potential mechanisms have been reviewed . General aspects of maternal diet during pregnancy such as intake of different foods and nutrients have been tested for association with islet autoimmunity or type 1 diabetes in the offspring in explorative analyses of longitudinal birth cohort studies, but convincing associations have not emerged to date [89, 90]. A retrospective survey reported that mothers of children with type 1 diabetes consumed less cod liver oil during pregnancy . Prospective studies including biomarkers are to be preferred, since these minimise the role of recall and selection bias. Cod liver oil is rich in vitamin D and the long-chain n-3 fatty acids docosahexaenoic acid (DHA) and eicosapentaenoic acid (EPA) are thought to have anti-inflammatory properties. 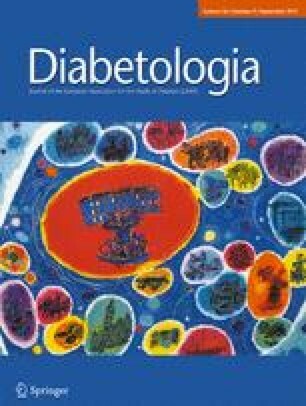 A prospective study of DHA, EPA and other fatty acids in the phospholipid fraction of maternal serum collected in late pregnancy found no association with risk of type 1 diabetes before 15 years of age , although possible degradation of polyunsaturated fatty acids during storage of samples could not be excluded. Using a lipidomics approach in the Diabetes Prediction and Prevention (DIPP) study, Oresic et al found that some lipid species differed systematically in blood samples from birth until seroconversion in children who progressed to type 1 diabetes as compared with controls . Further studies of this type are under way. Vitamin D status during the intrauterine period may be of special importance for development of the fetus . The decidual and trophoblastic cells in the placenta produce 1-α hydroxylase, and plasma levels of the normally tightly controlled active form of vitamin D (1,25-dihydroxyvitamin D) are usually higher during gestation . The few studies performed to date relating maternal vitamin D to type 1 diabetes in the offspring have reached mixed conclusions. Maternal dietary intake of vitamin D from food or supplements was not associated with islet autoimmunity or type 1 diabetes in the DIPP study . A Norwegian study found an association between higher serum 25-hydroxyvitamin D in samples collected in late pregnancy and lower risk of type 1 diabetes in the offspring , whereas a Finnish study found no such association with samples collected in the first trimester of pregnancy . It remains to be seen whether these conflicting results were due to differences in sampling time, analysis or other factors. Evidence discussed so far has been observational, and results must be interpreted with due attention to potential confounding, measurement error and selection bias. In practice, confounding can only be controlled in randomised (experimental) studies, but such studies often suffer from selection bias, limited sample size and limited contrast in exposure, resulting in low statistical power. Not all exposures can be randomised for ethical or practical reasons, but many can – although some ingenuity may be required [99, 100, 101]. We are not aware of on-going randomised studies of prenatal factors powered to investigate effects on islet autoimmunity or type 1 diabetes. A few animal studies have also tested the potential role of the perinatal environment in relation to risk of autoimmune diabetes, although such results cannot necessarily be extrapolated to humans. Complete depletion of vitamin D in NOD mice during intrauterine and early life led to a higher cumulative incidence of diabetes , but vitamin D supplements in utero or in early life (in addition to the vitamin D in normal mouse chow) made no difference . Dietary energy restriction in pregnant NOD mice reduced birthweight and incidence of diabetes in the offspring , in keeping with observed associations with birthweight in humans. NOD embryos implanted into the uterus of pseudo-pregnant surrogate mothers of other strains (DBA/2) had a significantly lower incidence of diabetes compared with NOD progeny implanted into NOD surrogate mothers . The authors suggest that maternal islet autoantibodies might be responsible for these differences , but this is contrary to the human experience , and other factors might well be involved. A few maternal cells enter the fetal circulation and are recognised as ‘self’. These can persist for many years in healthy individuals . In theory, a single T cell clone that is potentially reactive towards the (foreign, non-self) fetal beta cells may be transmitted from the mother and later expand and cause disease. Alternatively, maternal stem cells integrated in fetal/offspring islet tissue might potentially be recognised as alien and attacked by the offspring’s immune system, although healthy children are tolerant to genetically distinct maternal cells. It has recently been shown that substantial numbers of maternal cells reside in fetal lymph nodes, inducing the development of CD4+CD25highFoxP3+ T regulatory cells that suppress fetal anti-maternal immunity and persist for many years . Studies of patients with recent-onset type 1 diabetes have identified a higher number of maternal cells in the periphery and in the pancreas compared with controls [107, 108]. Maternal cells in the islets of deceased patients with recent-onset type 1 diabetes did not have an immune origin, which argues against activation of maternal immune cells . One hypothesis is that the increased numbers of maternally derived cells are due to an attempt to replace beta cells lost to as a result of immune attack . The potential role of maternal microchimerism in type 1 diabetes remains to be determined. Epigenetics is an evolving concept that concerns molecular factors and processes, independent of DNA sequence, but which influence gene expression and are stable over at least a few cell divisions. Here, we can only give a brief introduction to the field, and we refer the reader to the cited references for more details. There is increasing evidence for the involvement of epigenetic factors in differentiation of T helper cells into various subtypes, and chemical modification of histone tails influencing chromatin and accessibility of transcription factors appears to play a role in many regulatory processes over relatively short periods of time. MacFarlane et al recently reviewed epigenetic mechanisms potentially influencing the risk of type 1 diabetes . DNA methylation is thought to be involved in transmitting information from the intrauterine environment to regulate the processes involved in various aspects of later health and disease, and probably also plays a role in transmitting intergenerational effects of environmental exposures . Recent pilot data from a randomised trial in the Gambia suggested that pre- and peri-conceptional maternal micronutrient supplementation could influence DNA methylation in the offspring with some effects being expressed at 9 months of age and not at birth . In rodent models, paternal diet and exposure to toxins have been shown to influence DNA methylation and expression of genes relevant for metabolism in the offspring. Information was therefore somehow transmitted via the sperm, but, at least in one study, apparently not via methylation pattern in the sperm DNA . The role of epigenetics in the prediction and prevention of complex disease is still at an early phase of development . In addition to increased understanding of the molecular factors and processes involved in human gene regulation from projects such as Encyclopedia of DNA Elements (ENCODE; www.nature.com/encode/#/threads) and the International Human Epigenome Consortium (www.ihec-epigenomes.org/), we will certainly see improvements in performance and reduction in the cost of available technologies to assay epigenetic factors in large-scale human studies in the near future. Population-based epigenome-wide association studies have only recently become feasible . In principle, methylation pattern may to some degree be inherited, and available data suggest that the inheritance is relatively low but is variable across the genome. A low inheritance would be accordant with the idea that methylation pattern, at least at some loci, can be influenced by the environment. A study in monozygotic twins and a few individuals followed prospectively from before type 1 diabetes onset identified potentially differentially methylated regions in type 1 diabetes . As DNA methylation is in principle time- and tissue-specific, differentially methylated regions identified in patients at or after diagnosis compared with controls may well arise as a consequence of disease (reverse causation). More prospective studies in this field are under way. Despite some suggestive associations, there is no clear proof of principle that non-genetic prenatal factors have any direct influence upon the subsequent development of immune-mediated diabetes in humans or experimental animals. The evidence is circumstantial, most studies have (of necessity) been exploratory and the associations reported have generally been weak and inconsistent. Possible reasons for the inconsistency include methodological differences and confounding of intrauterine and postnatal exposures. Another possibility that has been little explored is gene–environment interactions, where the association depends on the presence of genetic susceptibility variants [71, 115]. The markers of risk that have been identified may simply be proxies for other more important causal influences. Nonetheless, and in the absence of any strong or consistent signal, it is difficult to conclude that major prenatal influences are at work. The possibility cannot be altogether dismissed, however, since loss of tolerance to islet antigens undoubtedly develops very early in postnatal life, and the intrauterine environment might plausibly set the scene for such a development. Greater understanding of the ontogeny of the immune system before and after birth will be needed before this question can be answered with any confidence. In our view, the available evidence does not currently support the initiation of randomised trials of preventive vaccines, dietary supplements or other agents during pregnancy to reduce the incidence of type 1 diabetes in offspring. Such trials will need to be based upon a much firmer body of evidence from observational studies in humans and, ideally, be backed by studies in experimental models. Longitudinal cohort studies such as The Environmental Determinants of Diabetes in the Young (TEDDY) study (www.teddystudy.org) and others will hopefully contribute to the evidence base needed to make such studies possible. L. C. Stene wishes to thank the Environmental Triggers of Type 1 Diabetes (MIDIA) research group (Norwegian Institute of Public Health, Oslo, Norway) and Kjersti S. Rønningen (Oslo University Hospital, Oslo, Norway), G. Joner (Oslo University Hospital, Oslo, Norway), M. Rewers (University of Colorado, Aurora, CO, USA) and C. Cardwell (University of Belfast, Belfast, UK) for stimulating collaboration and discussions. We apologise to the many authors of original research whose publications we could not cite owing to space restrictions. Research by L. C. Stene has been supported in part by the National Research Council of Norway. Both authors were responsible for the conception, design and drafting of the manuscript, and approved the final version for publication.